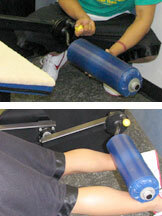 Position body with knees aligned with the machine's rotational axis. Adjust the foot pad as high as comfort permits to reduce the torque and shearing action to the knees. Adjust footpad and align knees with rotational axis. Maintain a neutral spine by engaging the abdominal region. Flex knees toward gluteals and hold for a count at the top of the movement. Return weight to the starting position in slow and controlled manner. Flex knees toward gluteals and hold for a count.